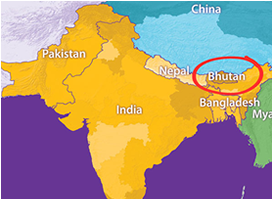 World Tour Plan > How to Apply For Bhutan Visa ? Every foreign visitor (except Indian,Bangladeshis and Maldivian nationals) to Bhutan require visa. No foreign missions/embassies abroad grant Bhutan tourist visas, they are issued only from Thimphu by the Department of Immigration, Ministry of Foreign Affairs. If you are booking tour with us, leave this headache to our staff. We will do everything. All you need to provide us is a copy of your passport by fax or email at least 4 weeks prior to date of travel. Once we obtain your visa, we send it to you (or your overseas agents and clients) by fax or email attachment as you will need it at the airport of embarkation and also at Paro International airport or at the Bhutan gates of Phuentsholing / Gelephu / Samdrup Jongkhar (that is you are entering via land route from India). Actual visa is stamped on your passport on arrival at the port of entry. You will have to pay US$ 40. We can process visa extensions for you in Thimphu if necessary. Book your tour package with a licensed travel agent, a local tour operator. Purchase & confirm your air-tickets with Drukair or Bhutan Airlines. Answer: You should expect to get your visa 1 to 3 days prior to your departure.Remember to print out a copy of your visa so that you can present it at the Drukair Check-in counter and also at immigration point. Answer: No, you only require a clear color scan of the detail page of your passport. Bhutan travel visa application is a digital submission process, thus we do not need to retain your passport but only submit a digital scan of your passport. Answer: If you have more than two weeks to your date of departure, it is advisable that you contact World Tour Plan or your travel agent to have you details updated with the Department of Immigration of Bhutan.